Character, literacy and celebrating diverse cultures were the main focuses of the Towards a Compassionate Learning Community program at Cambrian Heights School. As a diverse micro-community, Cambrian Heights School recognized the need to engage the students in literacy and culture, and to promote the love of reading outside of the school environment. 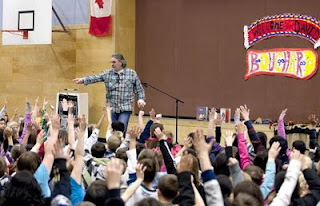 Thanks to the support of an EducationMatters grant, famous Canadian Author, David Bouchard was invited to spread his messages about the importance of literacy and discovering who you are to the Cambrian Heights students. Bouchard is a dynamic, passionate and engaging oral story teller and presenter who captures children's imaginations, while implanting powerful messages and lessons within the story. "This program was really three-fold," says Principal Bonnie Bilcox. "Children learned about character education, and how such virtues as honesty and humility make you a good person; there was a literacy piece that really brought the love of reading with your family at home to the forefront; and there was a cultural piece that allowed us to connect with the very diverse student population, and to celebrate their heritage." Bouchard's presentation was based on his book, The Seven Sacred Teachings of White Buffalo Calf Woman, which resonates with the messages of traditional First Nations values. The experience allowed children of First Nations, Métis, and Inuit descent, in particular, to really connect with Bouchard and reflect on their heritage and Aboriginal roots. Bouchard's presentation involved parents and was a piece of a bigger picture, as his book became the theme for the year's studies throughout all grades. Students participated in many projects that related to the Seven Sacred Teachings. Students were given the opportunity to collaborate with Matt Palmer a documentary filmmaker, and to interview Bouchard when he visited Cambrian Heights. "It was epic meeting David Bouchard and talking with him about his ideas for our documentary based on his book— The Seven Sacred Teachings. I interviewed him and asked him what inspired him to become a writer and I remember him saying that his grandmother, who is dead, was his inspiration," says student Paula. Learning leader, Christine McCrory says, "Bouchard is a very provocative and compelling individual who speaks about his own disconnect with his Métis heritage; as educators, we were realizing that a lot of our students couldn't identify with their roots and that there was a real lack of self-belonging." The Towards a Compassionate Learning Community program in combination with Bouchard's presentation left a powerful impact on a great many students. One of the most powerful examples was when a student, who had experienced violent social influences, stood up in front of his peers during Bouchard's presentation and spoke about his personal connection to Bouchard's lessons. Afterwards, Bouchard met privately with the student and gave him a book about embracing his Aboriginal roots. Watch David Bouchard present to Cambrian Heights students here.